"We are Indians living once more our old life. Soon we will be gone. Your civilization will destroy us. But by your magic, we will live forever." One of the many privileges of reviewing here at dOc is the chance to take a look at titles that I would otherwise have passed by. Given the thousands of discs being released these days, it is easy to overlook those that one is unfamiliar with, and The Silent Enemy: An Epic of the American Indian is among them. The sales blurb mentioned the fact that the film was created 60 years before Dances With Wolves, which has been, to me, one of the most interesting and poigniant looks at how the traditional native lifestyle is diminishing, and clearly, parts of that film were lifted from this one. The Silent Enemy was filmed during 1928 and '29, and as the producer notes in the commentary, could not have been made 10 years later, as many of the all Indian cast were dead within years of its release. At first glance, it could be thought that the title refers to the Indians as the enemy, when in fact the theme of the film is the hunger that these people faced long before the white man invaded North America and destroyed their way of life forever. While the storyline in this mostly silent film is fictional, the details of the events have historical reference, based on true accounts from the 72 volumes created by Jesuit missionaries who documented the history of New France and travelled with the Ojibways in the 17th century. It does play a bit melodramatic at times, but beneath there lies a commentary on how a people survived in a most hostile and unforgiving environment. It is similar in style and content to Robert Flaherty's Nanook of the North, though has less of a documentary feel. The Silent Enemy opens with the only spoken word dialogue in the picture, an introduction by Souix Chief Yellow Robe, who plays the part of Chetoga, the tribe leader. Here, he asks the audience not to look on them as actors, but instead as a people revisiting their heritage and lifestyle. We meet his tribe of Ojibways, camped on the banks of a river where they have spent the last six years. From the stories of their ancestors, the seventh year has been one of famine, and the lack of game in the area has their best hunter Baluk (Chief Buffalo Child Long Lance) advising that they should move north, to where the caribou run, if they want to survive the winter. Their medicine man, Dagwan (Chief Akawanush), has other ideas, most of them self-serving, as he tries to berate Baluk in the eyes of his people, in the hopes of gaining the chief's daughter Neewa (Spotted Elk) as his bride. Despite his luck at hunting a deer, Dagwan's bid for the tribe to remain where they are is overturned by the tribal council, and they pack up and head to the north, though it will not be an easy journey. Food is scarce, and the pervading hunger continues to plague the tribe. As we move deeper into winter, the starvation and effects of travel begin to take their toll, and casualties begin to mount. The deception of Dagwan continues to keep things tense among the tribe, and the chief offers himself as a sacrifice to the Great Spirit by fasting alone in the forest until his people are once again fortuitous in their hunting. Along the way we witness many tribal customs which enrich the piece, and when one takes into account the efforts involved to capture these images, the results are truly amazing. Not only could this film not have been made a decade later, it could also never be made today. Shot entirely on location in Quebec, 40 miles from the nearest settlement, the cast of Native North Americans endured temperatures of 30 to 40 degree below zero�often while performing in nothing but a loincloth. There are also many animal sequences that would not be allowed (justifiably) in todays' productions, as their hunting or combat with them would be forbidden by modern day codes. Utilizing wild and untrained animals, this film captures a fight between a bear and a cougar (which is shot from two camera angles), a confrontation between a bull deer and wolves, and the running and hunting of the caribou herds, sequences which will never again be filmed like this. There is an amazing amount of outstanding cinematography contained in this film, captured on hand-cranked cameras, long before light metering was available. While much of the staged action looks forced by today's standards, the scenery and several action sequences utilize techniques which, for their time, were brilliantly executed. Unfortunately for the producers, the production of The Silent Enemy came at a time when the moving picture business was in the transition from silent to sound films. With only its opening monologue spoken, the remainder relies on intertitles and an underlying musical score. 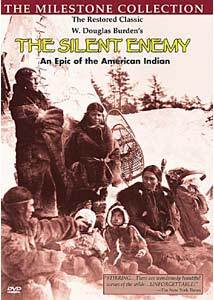 As released today, remarkably intact despite more than 70 years having passed since its creation, The Silent Enemy is a window into a time lost to history, when the Native Americans hunted the wilderness of Canada for survival, trying to remain one step ahead of the silent enemy—hunger. Image Transfer Review: The Silent Enemy is presented in its original 1.33:1 ratio, color-tinted black & white. For a seventy-year-old film, it is in remarkable shape. Sure, there are some print defects, but they are minor and unobtrusive. The tinting is consistent, be it blue, yellow sepia or simply black & white. Sharpness is fine considering the technology employed when filming, and contrast is excellent. You won't think this was shot yesterday, but it is very well preserved and presented here. Grading is compared to other films from this era. Audio Transfer Review: This is a "silent" film, with only the opening spoken. Dialogue during this segment is easily discernable. The remainder of the piece is accompanied by an organ score, which is surprisingly full-ranged and well presented. Given the film's age, I have no complaints whatsoever about what we have here. The commentary track does suffer from a fair amount of hiss and ambient noise, due to its recording on location. Occasionally the interviewer's questions are hard to hear, and there are technical problems throughout, however, we are still able to hear the content quite clearly, despite these issues. Extras Review: Image has thoughtfully included a small number of interesting supplements for The Silent Enemy, which help give a modern audience some insight into the importance and relevance of a film from this time. Foremost is the running commentary, which, while not screen specific, is an interview with producer W. Douglas Burden by film historian Kevin Brownlow (whose company was responsible for the film's preservation), covering many aspects of the production: technical, logistical, financial and otherwise. Despite a high degree of hiss and transient levels of background noise, there is a lot of interesting information presented here, which may prove quite eye-opening. There is also biographical material on producer W. Douglas Burden and preservationist Kevin Brownlow. The information on cast member Buffalo Child Long Lance is especially interesting. Details on the production are included, as are references for further reading on the film and its cast. I would add that while I have seen Criterion's Nanook of the North, the supplements raised my awareness of two other pictures in this genre that are available as special editions from Image: W. Douglas Burden's inspiration for The Silent Enemy, Chang and Grass, both by King Kong creators Merian C. Cooper and Ernest B. Schoedsack. With humanity's quest to dominate the natural world and replace it with one of our own creation, it saddens me when I realize how far we have come from living in harmony with our environment. As much as I accept the conveniences of the modern world, it has not come without cost, and I feel it is important to reflect on the heritage of many nations, lost with the passing of time. The Silent Enemy is a reflection of that past, a time capsule if you will, showing a way of life that no longer exists. It is not a glorification of history, but a document of a place in time, showing the hard struggle for survival these people faced. If Nanook of the North is a prize in your collection, The Silent Enemy is a worthy companion. Perhaps a bit overly dramaticized, there is still ample substance here, capturing a time that will never exist again. The camera techniques and cinematography are especialy worthy of note, and the inclusion of the supplemental materials greatly enhances one's appreciation of what is presented. Unfortunately, not all audiences will appreciate this film, but for those who can, it is respectfully preserved here. I am glad I didn't miss this one.